The Ruffed Grouse is a chicken-sized bird that is cryptically colored to blend in with its forested habitat. It has the distinctive behavior of “drumming” to attract a mate. In early spring, the male perches on a log, mound, or stone, and rotates his wings forwards and backwards so fast that the air rushing into the momentary vacuum creates a miniature sonic boom! The sound is very deep and increases in tempo. This territorial display peaks in mid-April and ceases by mid- to late May. The range of the Ruffed Grouse in Tennessee once extended throughout East and most of Middle Tennessee. Currently, it is found only on the Cumberland Plateau and the high ridges and mountains of eastern Tennessee. The breeding range extends from central Alaska across most of forested Canada to the northern United States, and south along the Appalachian Mountains to northern Georgia. The Ruffed Grouse is a popular game species in Tennessee and population numbers appear to be stable. Description: The Ruffed Grouse is a thick-bodied chicken-like bird with mottled gray and brown plumage overall, a slight crest, a moderately long, rounded tail that has a narrow dark band near the tip, and feathered legs. Males and females look similar, but females have a shorter crest and tail. Northern Bobwhite are half the size and have a boldly patterned face. They also typically are found in different habitats. 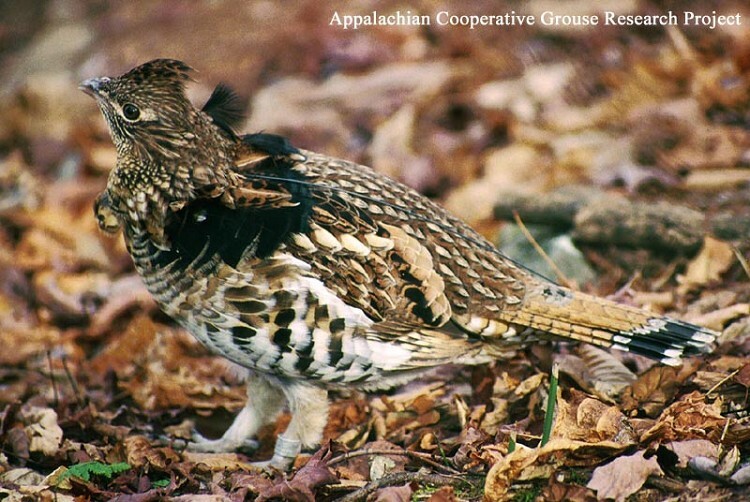 Habitat: In Tennessee, Ruffed Grouse are found in forests of mixed age. They prefer mature, predominantly deciduous forests with laurel, rhododendron, and blueberries in the understory, and patches of early successional habitat, 5 to 15 years old, nearby. Diet: Buds, twigs, catkins, leaves, ferns, soft fruits, acorns, and some insects. Nesting and reproduction: The female visits the drumming male to be fertilized and the male plays no further role in reproduction. Peak egg laying is in mid-April. Clutch Size: Usually 10 to 12 eggs, with a range of 7 to 16. Incubation: The female incubates the eggs, which hatch in about 23 to 26 days. Fledging: The young leave the nest within hours of hatching and begin hunting for insects shortly there after. They can fly in about 2 weeks and stay with the female until they are 12 to 16 weeks old. Nest: The nest is in a bowl-shaped depression on the ground, usually at the base of a tree, stump or under a bush. It is lined with dead leaves and grasses. 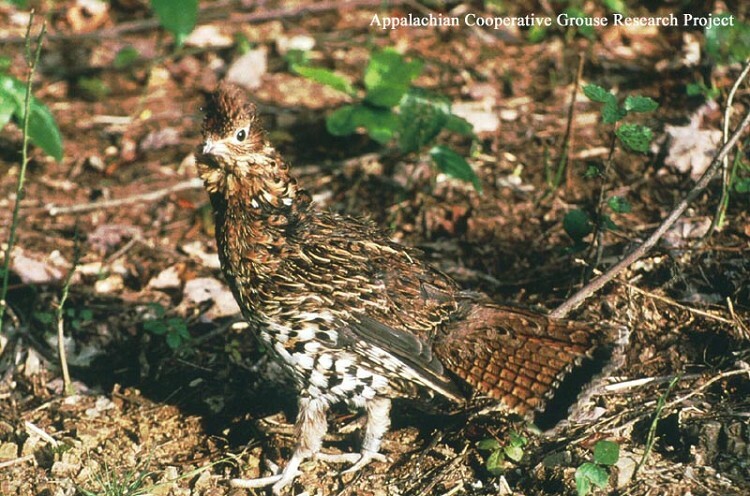 Status in Tennessee: The Ruffed Grouse is an uncommon permanent resident in East Tennessee and locally uncommon in Middle Tennessee. The population appears to be stable. The Ruffed Grouse is a popular game species in Tennessee. During the 1989-1990 hunting season, 21,000 hunters harvested approximately 50,000 birds. TWRA's effort to reestablish a population on the Western Highland Rim has been marginally successful. In winter, Ruffed Grouse grow projections on the sides of their toes, that act like snowshoes. In the northern part of the range, research has found that Ruffed Grouse populations follow the cycles of the snowshoe hare. Every 8 to 11 years, when the numbers of hares are high, the numbers of predators increase. When the hare numbers go down, the predators switch to eating grouse, decreasing their numbers. Predator numbers then decline and the process is ready to begin again in a few years. Ring-necked Pheasants and Wild Turkeys are known to occasionally lay eggs in the nests of Ruffed Grouse. The oldest known Ruffed Grouse in the wild was 8 years, 6 months old. Best places to see in Tennessee: Ruffed Grouse are more easily heard than seen. Males drum from mid-April through mid-May. They can be found in the Northern Cumberland WMA, Great Smoky Mountains National Park, and Roan Mountain. Rusch, D. H., DeStefano, M. C. Reynolds, and D. Lauten. 2000. Ruffed Grouse (Bonasa umbellus). The Birds of North America, No. 515 (A. Poole and F. Gill, eds.). The Birds of North America, Inc., Philadelphia, PA.